The 85th percentile speed can be a confusing statistic for some to understand. The Minnesota Department of Transportation defines the 85th percentile speed as, “the speed at or below which 85 percent of all vehicles are observed to travel under free-flowing conditions past a monitored point.” Traffic and Transportation Engineers use the 85th percentile speed as a guide to set the speed limit at a safe speed, minimizing crashes and promoting uniform traffic flow along a corridor. With this definition, it would seem that the signed speed limit of a road would be highly influential in determining the 85th percentile speed, however the exact opposite is the case. Let’s take a deeper dive into 85th percentile speed, and why it is a major consideration in determining a roadway’s speed limit. The ‘feel’ for the road can be as simple as being the regular route that someone drives for years. For example, on a recent trip to California I was driving along Highway 1, an extremely scenic and windy, 2-lane un-divided roadway along the ocean. I felt like I was driving a fast pace, however the local Fort Bragg in California, traffic thought otherwise, zipping past me at a speed I would definitely have been uncomfortable at traveling along the specific roadway. 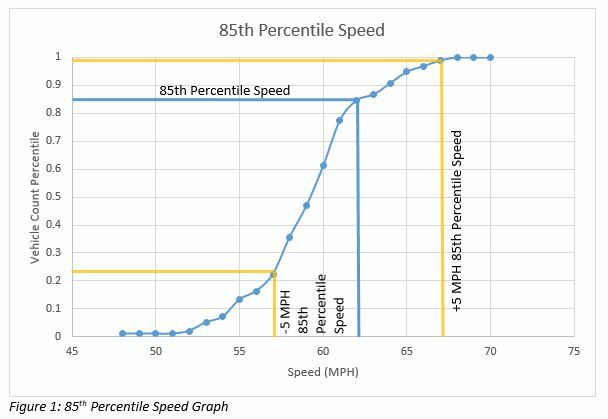 With so many factors impacting the speeds on a roadway, the 85th percentile speed becomes a good metric that can quantify these variables and put them into one useful number. There are two main techniques for collecting this data, directional tube counts and handheld radar. So how is the 85th percentile speed determined? By the completion of a spot speed study test. For a Spack Consulting project located south of Hibbing, Minnesota on Trunk Highway 73, roughly 100 free flowing vehicle speeds were collected over a two-hour period using handheld radar. These speeds were then plotted to create the following figure. As shown in Figure 1, the 85th percentile speed of this roadway segment is roughly 62 MPH (blue line). Using this as the base point, the percent of vehicles traveling up to 5 MPH over and under this speed limit were also checked (yellow lines). As the figure shows, only 23% of the total vehicles on the road were traveling less than 5 MPH below the 85th percentile speed, while less than 2% of vehicles were traveling more than 5 MPH over the 85th percentile speed limit. This means that roughly 75% of vehicles on the road were traveling within 5 MPH of the 85th Percentile Speed. This is why the 85th percentile speed is such a large consideration when determining speed limits. If the speed limit is set to the 85th percentile speed, we know that 85 percent of drivers will be driving at or below the speed limit, and that a majority of vehicles will be driving within 5 MPH of the speed limit (75% in our example). This uniformity of vehicle speeds increases safety and reduces the risks for vehicle collisions. When vehicles deviate from a standard speed, either faster or slower, the potential for accidents increase, whether caused by a slow car in a rear end collision or a fast car completing lane changes to maneuver through slower traffic. By setting the speed limit to the 85th percentile speed this uniformity is achieved and safety is increased. In our previous example, a 60 MPH speed limit would be recommended because speed limits are set in 5 MPH increments. 60 MPH was chosen over 65 MPH due to the current roadway speed limit of 55 MPH, the 2-lane layout of the road, and lack of separation between opposing traffic flows. The 85th percentile speed justifies this change and helps assure that it is a safe and strategic speed limit change. “Most people don’t drive according to the posted speed limit, but account for the visual aspects of the road and a ‘feel’ for the road.” Totally absurd statement. IF you doubt me, go to the autobahns and note the speeds…and the road conditions are not that different from US. Of course the speed limit affects the speed that people drive…and to use that coerced speed as the determinant for limits is a impure as your spelling (or word choice…I offer “defiantly” as an example. Good idea on the dissertation, not so strong on the actual performance. The 85th vs. the design speed of a roadway comes up more often than I’d like in my job. The frustrating thing is having a road designed, constructed, and initally signed to a 45mph design speed, and with the safety factors (or based on drivers with a slower reaction time) that appear to be built into design speed particularly regarding horizontal alg and superelevation, motorists often drive at 55mph+. Subsequently the county (with state’s oversight) then updates the road for radar at 55mph and signs it as such. The problem then becomes as new developments come into the area, for a road with considerable H&V curvature, obtaining a location that meets ISD can become very difficult (and where crest curves were built to the min value for 45, you no longer have stopping sight distance). Additionally on one of our newer 4 lane roads with median, there is a desire to landscape the road, but now with a 55mph zone, you can’t do much in the median, and off to the side of the road you have to push trees further away due to clear zone distances increasing with the 55mph limit. Thank you Mike for your insight on the 85 percentile. Using the 85th percentile makes sense for roadways that do not have cross traffic, traffic entering lanes of traffic from driveways, line of sight problems that became evident because of the 85th% posting instead of prima fascia speed law. Which, I believe contiguous properties to the thoroughfare have an influence. In my research I believe the ingress and egress easements are extensions to the properties they serve, therefor those properties are contiguous to the thoroughfare and prima fascia speed law should apply, when you add line of sight issues, cross traffic, etc on old roadways that would need to be completely realigned to make the 85% a safe posting. does this make sense. Does the exisitng posted speed limit affect your speed test results? Drivers usually drive about 7 mph (10 km/h) higher than the posted speed limit. If the posted speed limit was 60 mph, you may get a 67 mph 85%ile speed. Good Article but the definition for pace is the 10 mph range that has the highest number of observations. Using the graph it looks like the pace would be 54 to 64 mph. The ten MPH pace is defined as the 10 MPH band of travel speeds containing the largest number of observed vehicles. ITE draft guidelines suggest that the speed limit within a speed zone shall be set at the nearest 5 MPH increment to the 85th percentile speed or the upper limit of the 10 MPH pace. Mike – Do you cover existing speed limit signs during the survey so drivers are not influenced by legal ramifications? You write, “Most people don’t drive according to the posted speed limit, but account for the visual aspects of the road and a ‘feel’ for the road. That may be true for minor roads and urban streets having no or very little enforcement. But, on highways, a large number of people drive about 5 to 10 mph above the speed limit. People may desire to drive even faster but do not want speeding tickets and drive a speed where they think they will not be pulled over. So, when we rise the speed to the 85%-ile, which typically will be around 5 mph above the old speed limit, people will drive even faster. It is in my opinion a grave misconception that drivers know what is a safe speed, and drive at such speeds naturally. If we want reasonable safety, we should rather set speed limits that are reasonable and then enforce them with frequent speed cameras. The US is back to around 35,000 fatalities per year. If we had Scandinavian safety on our roads, the US would have much fewer. Sweden had 260 fatalities in 2015 and with the US having 30 times more people, the US should have around 7,800. Considering that Americans drive about 30% more miles per year than the average Swede, some people could argue that the US could be afforded around 10,000 fatalities per year but one should also consider that Americans walk and ride bicycles less so if we here switched to Scandinavian habits, we would probably have many more fatalities among those alternative user groups. One reason Sweden has fatality rates that are a third of the US ones is that speed limits are set by ‘experts,’ not by drivers, and that speed limits are enforced to a higher degree and with very low margins. Thank you very much for the thorough explanation. I learned something new about taking into consideration the + or – 5 mph deviation from the 85th percentile speed. I really like your articles and the technical information you share. I’d like to find information on how the 85th percentile might be or is applied to residential street speed enforcement. For example – The Sheriff does not want to cite drivers until they are over the 85th percentile (even more for a “buffer”) because the “speed trap” defense can be successfully used. I looked for the original reference for the 85th percentile concept, so far I haven’t found it. If speed limits are not enforced will the average or 85th percentile speed increase? If the posted speed limit is e.g. 25mph and the 85th percentile speed is 32mph should tickets be issued for vehicles traveling at 33mph? If tickets are not issued until vehicles are caught at 40mph or over, will drivers figure this out over time and drive as if the speed limit is e.g. 35mph? Does enforcement lower the average or 85th percentile speeds? There is much talk about what the drivers do or want to do (e.g. 85th percentile) but little talk about residents, along subject residential streets, that may think the vehicles are traveling too fast even if the 85th percentile speed might not be considered high. What are the criteria for installing speed humps or other modifications even when the 85th percentile speed seems within reason? Do you have an URL for the “original” paper where the 85th percentile started? Thanks for the reply. It seems a bit ironic that the 85th percentile “theory” is mentioned frequently in discussions on traffic speed but the reference(s) are not listed and so far not easy to find. E.g. my city has a Traffic Safety Commission and on the website there is a description of the 85th percentile without a reference. Interestingly enough the vast majority of residents addressing the Commission complain about high traffic speeds on their street. Hi Henry – The 85th percentile speed is a statistical construct. I understand your perspective that you’d like to get to the underlying research. On the flip side, what are you and your neighbors using to define “too fast?” If your street was designed to safely allow vehicles to go 40 mph (which most suburban streets are) and there are no crash problems, what’s the issue from an engineering perspective? I’ve read a few, what I would call, anecdotal stories on the statistical construct – I’m still looking for the original reference possibly explaining statistical approach. I’m from the school of, if it isn’t written it didn’t happen. I want the reference so I can understand/argue if/when I engage with the Commission on the enforcement speed trip point and if the Sheriff will write tickets using radar without a current valid survey. In our town there are a number of streets that now have speed humps. It will take more digging to find out how they got those approved and funded/etc. Those streets don’t seem to be much different than the street I live on so let’s assume the traffic speeds were similar to my street before the humps were installed. My street is shown as a “major collector” with California CRS and also listed as a “local” street on the City website. Other streets with humps have the same classification on CRS. To answer your question, I/we don’t care that the street can safely (from the traffic engineering point of view) handle 35mph, I/we don’t like the current speed profile. I’m not sure how else to say it – we don’t care about the street width, 85 percentile or Soloman theories. We don’t like the environment the high speeds create. I suspect that the other streets that got the speed humps installed managed to get enough people to attend the Commission meetings to make their voice heard and the City responded. I can empathize with the engineering approach but I think this situation is more physiological in nature than many traffic engineers thinks it is. I think this is a trend – e.g. you see in many places where roundabouts/etc. have been installed on neighborhood streets say in the last 10 years. Berkeley is an example. People want their neighborhood to be more livable. To put it another way – when many cars are going 40+mph on a residential street posted for 25mph and your kids are playing in the front yard or you are walking down the street (we have no sidewalks) you don’t have a comfortable feeling. The Sheriff used to patrol the street with radar but hasn’t for a few years now. I’m working to get the enforcement re-instituted. I have a hard time setting up spreadsheet for 85th percentile. Help? Care must be taken when collecting data on a two lane two-way roadway. Typically the direction given to those collecting the data to only collect the speeds of free flowing vehicles. This means that in a group only the speed of the lead vehicle is then recorded. Ideally, if there are a lot of following vehicles, the speed data should then be collected during lighter traffic flows. Otherwise every following vehicle in a “pack” is actually a “vote” for a higher speed limit, but they are not recorded. I got an email indicating additional activity on this thread. This reminded me of my original question – What is the origination of the 85th percentile “rule”? If the origination is a statistical construct then there should be a “first” paper. Can you provide a link? Since my last posting here an additional speed survey was done on my street. The 85th speed went up during a period of no enforcement. I have my doubts that the 85th percentile rule holds for a residential street with cross streets, pedestrians from two nearby schools and cyclists. Thanks for the comment. What you are mentioning is correct, however there is also potential of the reverse situation, where the vehicle in the front of the platoon is driving faster than they normally would without a following platoon due to the “pressure” of the vehicles behind them. By only collecting the first vehicle’s speed when a platoon is present, and collecting a large enough sample size of vehicles to ensure stand alone vehicle speeds are collected as well, a reasonable and accurate free flowing speed can be determined. This is very clear – thank you. I have been confused when the Seattle Department of Transportation says things like “Vehicle speeds average 31 MPH (85th percentile for speed)”. I wondered if they just ignored the 15% lowest speeds before averaging, or randomly took out 15% of the data before averaging. Based on your information, I think they mean the 85% percentile speed is 31 MPH. I’ll see what they say. 60 would indeed be the recommended limit with most engineers. Some would say 65 to account for the probable increase in the actual 85th percentile speed of 1 mph after a posted increase of 5 mph. Note that limits at the 85th percentile speed tend to be the safest with the fewest crashes. The most extensive research ever done on what happens with increased and decreased posted limits was done for the FHWA in 1992 by Martin Parker and Associates. You can raise a too-limit by up to 15 mph, or lower a good one by up to 20 mph – and the actual 85th percentile speed will change by no more than 3 mph, but usually by 0 to 2 mph with an average change of 1.5 mph. Posted limits have almost no effect on the actual travel speeds. When set at an all-too-typical 10 mph lower than the safest 85th percentile speed, all that does is enable for-profit speed trap enforcement rackets that primarily ticket the safest drivers on the road. Reactively setting speed limits based on how fast drivers would like to drive (rather than how fast they should drive given the context and design of the road) is a failed policy. Given the U.S.’s horrific auto/ped/bike crash stats compared to other developed countries, it’s surprising more state DOTs and municipalities haven’t scrapped the 85th percentile rule. Also, equalizing (faster) speeds between vehicles for safety really only applies to highways, not surface streets. NACTO’s recommendation of setting target speeds based on context and roadway design is the future. We shouldn’t let drivers set speed limits just like we shouldn’t let children set their own bedtime. Hi Mark – we agree that deciding on a speed and designing the road and other characteristics to match that chosen speed would be best. However, many (most?) existing roads were not built to that standard. Arbitrarily setting a lower speed limit on an existing road when everything else tells a driver to go faster also creates difficulties. The 85th percentile speed still works in those situations, keeping more drivers within a ten-mile pace and ensuring most drivers aren’t breaking the law by driving to conditions. After additional digging it seems the 85th “theory” has roots in the 1964 Soloman paper. That study has no mention of cyclists or pedestrians and the data was from rural roads or highways. We are aware that in that time period the car was king, I suppose there was relatively little talk about pedestrian and cyclist safety. Somehow over the years the 85th percentile “rule” got baked into various vehicle codes and baked into traffic engineers thinking. At this time in history ( e.g. promotion of walking and cycling) does not combine well with the 85th percentile guidelines in certain cases. I tend to agree with Mike as it relates to higher speed rural roads. I agree with Mark as it relates to high density residential streets. An interesting outcome given that cities are adhering to the 85th rule is some streets become speed unenforceable. For example on my street the 85th speed has risen (due in part to non-enforcement) to a point that radar enforcement can no longer be used unless the posted limit is raised at least 5MPH. This creates a ratcheting effect (local traffic Sargent words not mine). Now we are faced with no enforcement for the foreseeable future leaving infrastructure changes (e.g. speed humps) as the only option. Mark – I like the children setting their own bedtime – I’m going to use that if you don’t mind.